Ipoh, Perak is known as the best vacation and retirement location in Malaysia. It is almost equidistant between Kuala Lumpur and Penang. The location of our Ipoh 5-star hotel is just 5 minutes after exiting from the North-South Highway along a straight Tambun Road to The Haven Ipoh. 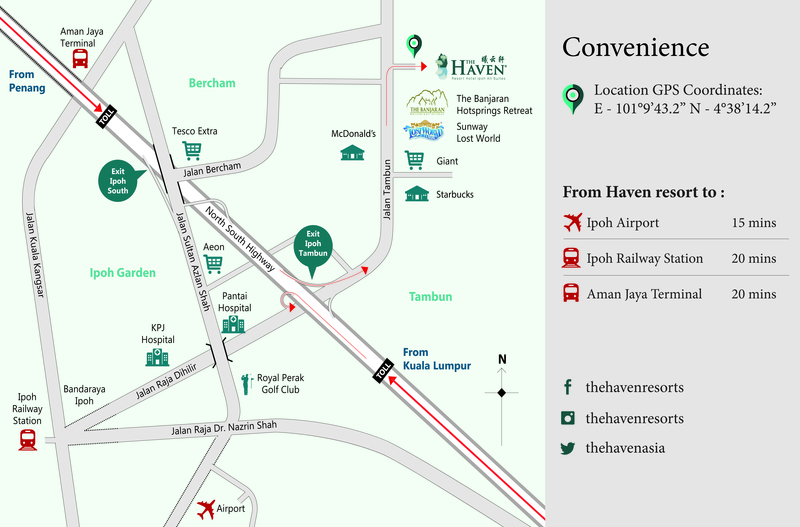 How to get to The Haven Ipoh! If you are taking a flight, train, or bus to Ipoh, it is easy. 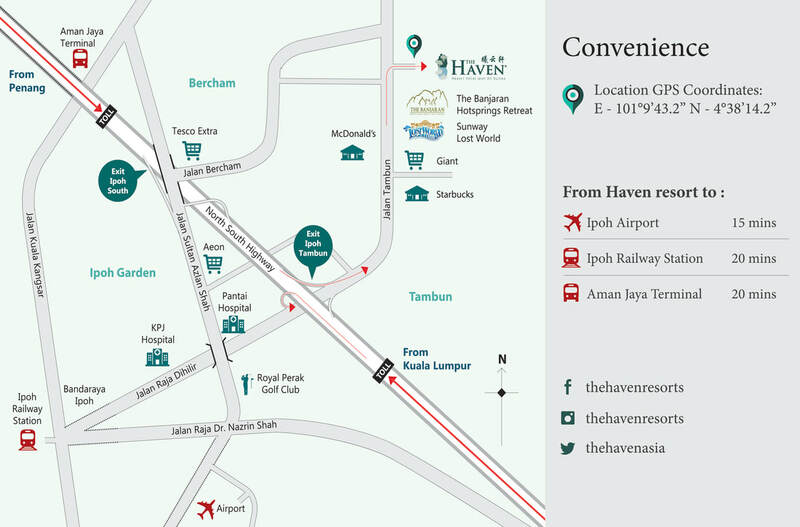 Just hail a cab, or arrange for pickup service with us at The Haven Resort Hotel, Ipoh upon arriving. 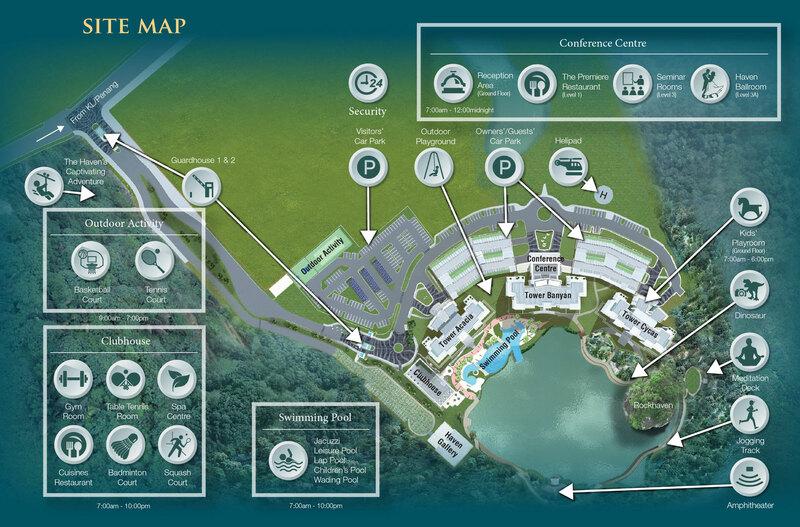 Download The Haven Resort Hotel, Ipoh Location Map here. The express buses that will take you right into Ipoh City. From the Amanjaya Bus Terminal (Ipoh), it is a mere 20 minute ride to The Haven Ipoh. The Electric Train Service is a convenient and comfortable way to reach Ipoh. If you are flying into Malaysia via Kuala Lumpur or Penang, then getting to Ipoh is a breeze with KTM’s new ETS. Fly direct into Ipoh with Tiger Airways (Scoot) or Firefly Airlines, operating direct flights either from Singapore. Click here (Link 1, Link 2) to book.